The transmission lines are modeled by means of the parameters resistance, inductance, capacitance and conductance. Resistance and inductance together is called transmission line impedance. Also capacitance and conductance in parallel is called admittance Here we are not going to derive the formulas rather to develop some concepts about the transmission line parameters. It will help us understand the transmission line modelling and in analyzing the power system. In this article we will discuss about the line resistance and inductance. In the next article we will discuss about line capacitance and conductance. The conductors of the transmission lines have small resistance. For short lines, resistance plays an important role. As the line current increases so do the ohmic loss (I2R loss). When the current exceed a certain value the heat generated due to ohmic loss starts to melt the conductor and the conductor becomes longer that results in more sag. The current at which this condition of conductor is irreversible is called thermal limit of conductor. Short overhead lines should be operated well within this limit. Here ρ is the resistivity of the conductor material which is a constant. Transmission lines usually use ACSR conductors with spirally twisted strands. So the actual length of the conductor is about 2 % more than the ACSR conductor length. So from the above formula, the resistance of the line is proportionately 2% more than the conductor length. Another important factor is that when the frequency of current increases the current density increases towards the surface of conductor and current density at the center of conductor is less. That means more current flows towards the surface of conductor and less towards the center. This is well known skin effect. Even at power frequency (60/50 Hz) due to this skin effect the effective cross sectional area of conductor is less. Again from the above equation it is clear that the conductor resistance is more for higher frequency. So AC resistance of conductor is more than the DC resistance. Temperature is another factor that influences the resistance of conductor. The resistance varies linearly with temperature. The manufacturers specify the resistance of the conductor and one should use the manufacturers data. For medium and long distance lines the line inductance (reactance) is more dominant than resistance. The value of current that flows in a conductor is associated with another parameter, inductance. 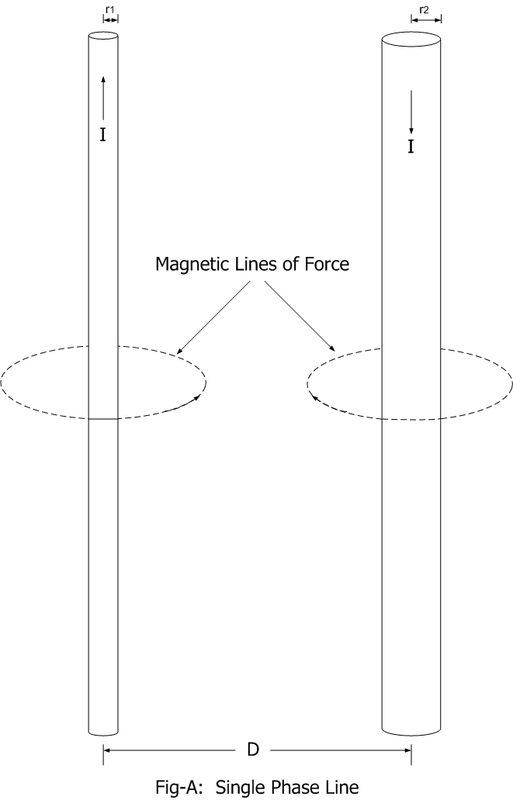 We know that a magnetic field is associated with a current carrying conductor. In AC transmission line this current varies sinusoidally, so the associated magnetic field which is proportional to the current also varies sinusoidally. This varying magnetic field induces an emf (or induced voltage) in the conductor. This emf(or voltage) opposes the current flow in the line. This emf is equivalently shown by a parameter known as inductance. The inductance value depends upon the relative configuration between the conductor and magnetic field. Inductance in simple language is the flux linking with the conductor divided by the current flowing in the conductor. In the calculation of inductance the flux inside and outside of the conductor are both taken care of. The inductance so obtained is total inductance. Now onwards if not exclusively mentioned then inductance means total inductance due to conductor internal and external flux linkages. The symbol L is used universally to represent inductance. L is measured in Henry (H). It is usually expressed in smaller unit, milli Henry(mH). Manufactures usually specify inductance value per kilometer or mile. It should be noted that, in all the formulas below inductance L is in Henry per unit length and not simply Henry. Here few cases are depicted. 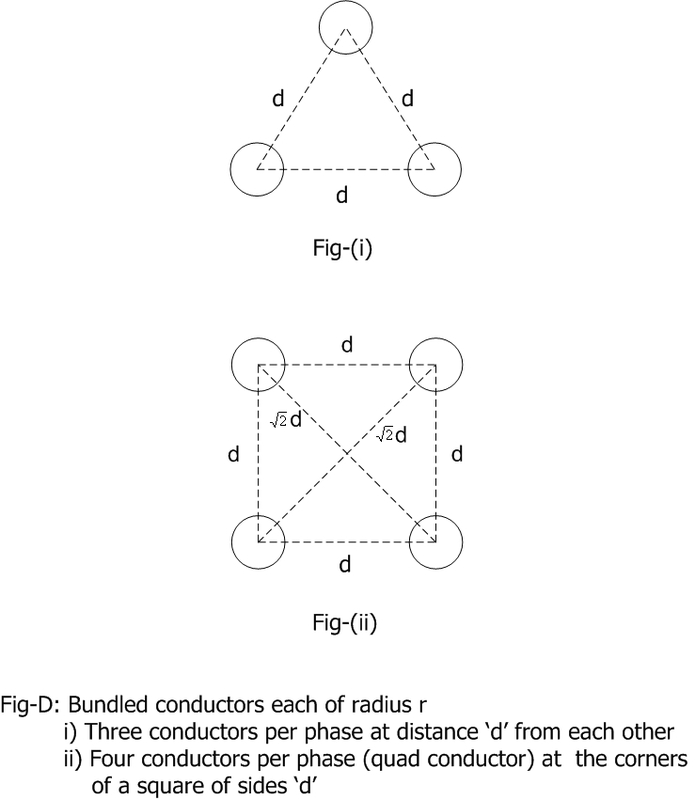 Here D is the distance between the centers of conductors. r1 is the actual radius of the conductor. As already said r' is 0.7788 times the actual radius(r) of conductor. Beginning from the single phase line, it is observed that all the three equations for inductance of a phase conductor are similar. Remember that this formula for three phase line is not valid for non-transposed lines. 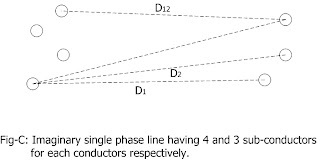 In single phase case GMD is simply the distance between the centers of two conductors. 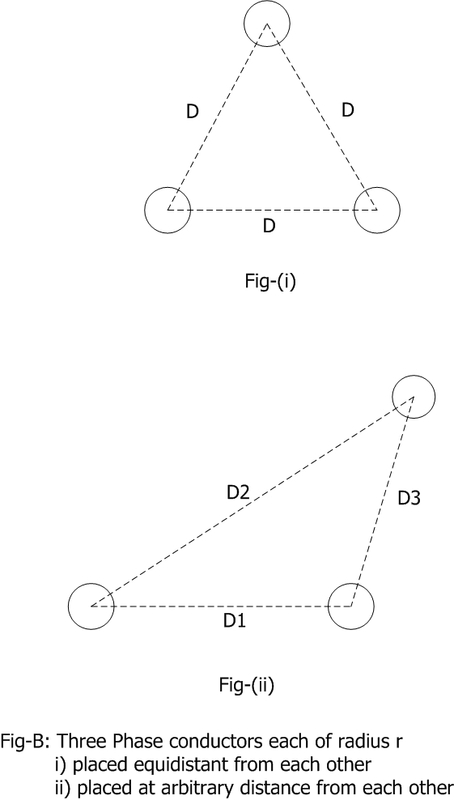 In three phase case for conductors equidistant from each other GMD is the distance between any two phase conductors. In all the three cases Ds = r'. From above we can conclude that GMD is like equivalent distance between conductors. When two or more conductors per phase are used as in bundled conductors then GMD is required to be computed. Here distances from each conductor in one phase to each conductor in other phase is calculated. If for example in a single phase line there are 4 conductors in one phase and 3 conductors in other phase (Fig-C) then we will have 12 numbers of distances between the conductors. I have shown four distances only. so here GMD is the 12th root of product of 12 numbers of distances. How to calculate GMD of three phase line with bundled conductors? 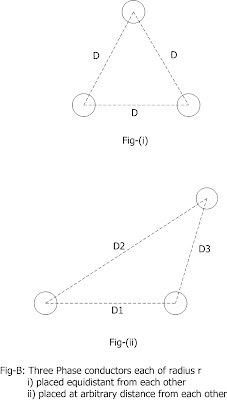 For an example see Fig-E where three phase bundles (triple conductror) are placed horizontally on transmission towers. 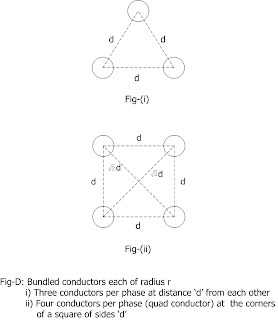 In this case the distance between the conductors (D) is taken as distance between the centers of bundled conductors. You can also calculate considering the distance from each bundled conductors of one phase to other conductors of two other phases. But the GMD calculated does not vary significantly from our simple form above. This is due to the fact that D is quite larger than d.
For ACSR conductors GMR is specified by the manufacturer.If this GMR is called Ds. For example if two such ACSR conductors(twin conductor) are used in a bundle for each phase. The GMR of the phase conductor arrangement is calculated imagining that the supplied GMR (or Ds) as the equivalent radius of ACSR conductor. We will discuss Inductance and capacitance for double circuit after discussing line capacitance in next article. Usually it is not always possible to arrange the phase lines equilaterally on the towers. To make the inductance and capacitance of all the three phases nearly equal, the conductors are transposed. Which means the conductors exchange the position after 1/3 rd of line length. By transposing the inductance and capacitance of all the three phase lines are made nearly equal. This helps balancing the three phase voltages at the receiving end of the line. Although the above formulas are derived considering transposition, the same formulas are also used for non-transposed cases to get approximate values. How do you calculate GMR for a stranded conductor if the manufacturer has not provided it? For example, can you calcute GMR for AAAC (OAK) given that it has 7 strands of 4.65mm diameter each and that the overall nominal diameter is 14mm with a nominal CSA of 118.9 mm2? Because DC flows steadily through the wires without changing direction many times each second and through the entire conductor rather than at the surface, DC transmission lines typically lose less power than AC transmission lines, so power transmission equipment is must. Very useful information. A coverage about role of susceptance in model for a long transmission line, would have been most welcome. Anyway, thanks for the info. very good.but what about capacitance and conductance? And is per conductor or for the circuit? 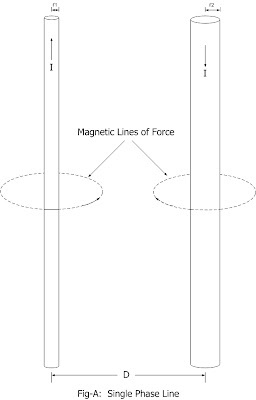 The magnetic permeability is not for air , it is just for free space , isn't ? How to calculate GMR of conductors when 25 dia of ropes placed on 50 dia centreal conductor. In fractional frequency transmission system we only take inductace in to account not capacitance why? This the impedance part what about admittance part? than you for the clear explanation! how about the total inductance of single phase 2 Hallow wire sir? good explanation sir! thank you! Can you help me and advise how to calculate GMD and GMR of this system please. The arrangement of this 16 cables is 8×2 means all the above 8 cables are positive and all the bottom ones are negativ. I can give you more details of you want about this system. Thank you Sir for posting such a clear and simple explanation...! Overhead transmission line has appreciable inductance because the loop it forms has . . . . X-sectional area? I fell so in love with this information, how do I keep contact with new Power System information of any Electrical Engineering principles from you? May I know what is the relationship between reactance and temperature like Temp and Resistance?Do we need to consider the temperature impact on reactance when temp increase?